This fellowship is designed to foster the work of young researchers in the cardiovascular field. What is the ISHR–ES/SERVIER Research Fellowship? 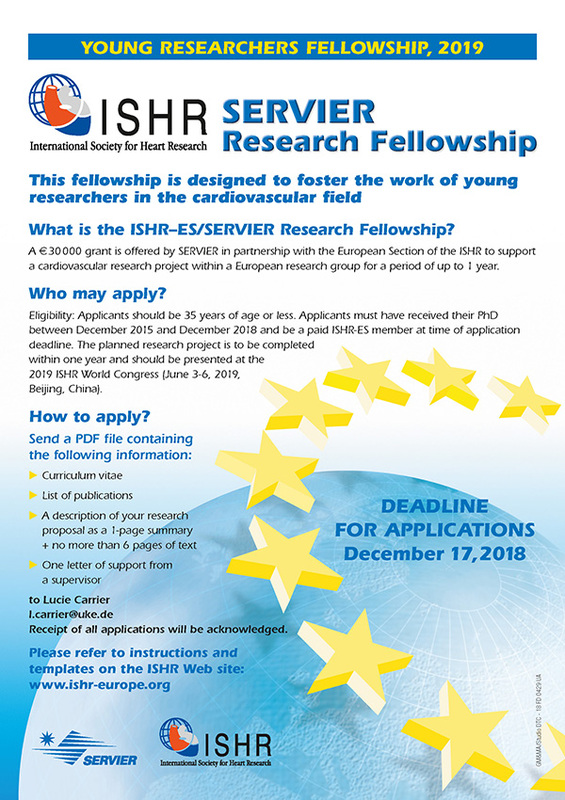 A €30,000 grant is offered by SERVIER in partnership with the European Section of the ISHR to support a cardiovascular research project within a European research group for a period of up to one year. Eligibility: Applicants should be 35 years of age or less. Applicants must have received their PhD between December 2015 and December 2018 and be a paid ISHR-ES member at time of application deadline. The planned research project is to be completed within one year and should be presented at the 2019 ISHR World Congress (June 3-6, 2019, Beijing, China). Applications for the ISHR/Servier Research Fellowship for 2019 have now closed. Applications for the 2018 Travel Awards have now closed. Each receiving €300 to attend the ISHR-ES meeting in Amsterdam. In 2017 the ISHR-ES announced a new Joint ISHR-ES and National Cardiovascular Society Poster Award. Please see Joint Program (pdf) for information. The ISHR-ES Ketty Schwartz Award is conferred, at the ISHR-ES Annual Meeting, by the Council, on members for their sustained contributions to the ISHR-ES. The ISHR-ES Medal of Merit is conferred, at the ISHR-ES Annual Meeting, by the Council, on members who have made sustained and outstanding contribution to cardiovascular science.